Excessive tropical moisture and a stalled out cold front will combine to bring heavy rain and possibly flooding to parts of Upstate New York, Pennsylvania and New England through Wednesday. An evolving situation over our region has raised concern for flooding, despite months of dry weather, as some extreme rain will be possible through Wednesday. A plume of extremely rich tropical moisture is moving northeast into the Finger Lakes and surrounding regions ahead of a cold front dropping southeast from the Great Lakes. The magnitude of the moisture in the air is almost unheard of, though the highest amounts of moisture will pass to the east of the Finger Lakes. As the front drops towards us, it will slow down and stall out. Rain and thunder will develop along and ahead of the front this afternoon and persist through the night and into Wednesday. Much of this rain will be moderate to heavy and it could result in some extreme amounts of rain for some localized areas. Generally speaking, the highest rain amounts will be to the south and east of the Finger Lakes. Still, plenty of rain is expected in the Finger Lakes area as well. Most places should easily exceed 1-inch of rain, except perhaps the far western reaches of the Finger Lakes. There is a decent chance for widespread amounts over 2-inches, with the chances for more than 2-inches rising the further east you go. Since it has been so dry since early July, 2-inches of rain wouldn’t cause any problems. However, it is likely that there will be pockets that get much more than 2-inches. Excessive rainfall on the order of 5-inches or more is not out of the question for some localized areas. It does not matter how little rain has fallen- 5 or more inches of rain in a day or less is going to cause some flooding problems. This is an evolving situation with many pieces and some extreme parameters setting up. Please continue to monitor the forecasts, heed all warnings from the National Weather Service, and remember your flood safety. This system should clear out by Wednesday afternoon or evening. Showers will remain a possibility for the remainder of the week. 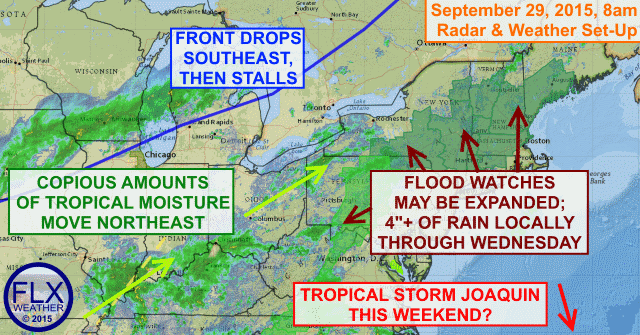 Unfortunately, more trouble may be on the way this weekend, as newly formed Tropical Storm Joaquin ***possibly*** moves towards the Northeast. There is a huge amount of uncertainty with Joaquin as it interacts with this same cold front. Stay tuned.